Businesses rely on their computer networks to store and retrieve documents from their databases, and various types of data backup services to protect their data, including cloud storage services, backup tapes, and external hard drives. If a network is compromised by a virus or security breach, it spreads throughout the network and infects every employee workstation, and could ultimately destroy large volumes of information. This nightmare scenario has happened to countless unprepared companies who felt their protocol kept their networks secure. According to recent disaster recovery reports, companies who fail to fully restore their data after disaster end up going out of business entirely. The cost of downtime, replacing equipment, hiring disaster recovery personnel, and losing customers tends to bring them under. Smart companies know they need a disaster recovery plan to prevent the damaging effects of data loss. There are several preventive methods to help your company avoid this disastrous situation. 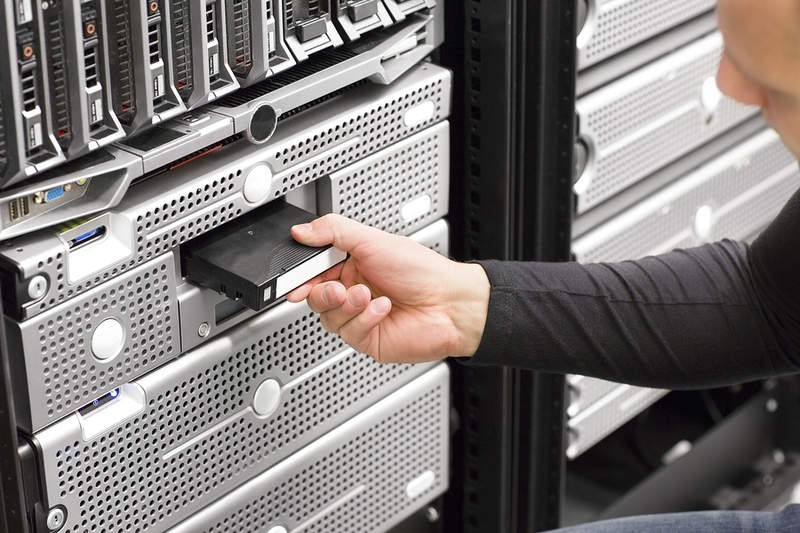 Although cloud storage and backup services are becoming more cost effective, smaller businesses tend to stick with the type of backup system that’s been working well for decades- which in most cases is offsite tape storage and rotation. Magnetic tape is an ideal storage medium for backing up individual workstations or small networks, mainly because it has the capability of storing high volumes of information at a low price. In addition, it makes it easier to store archived cartridges at offsite facilities for enhanced security and protection against in-office issues, natural disasters, and more. Tape backups allow companies to restore and recover lost data immediately if your business suffers from a fire, theft, or natural disaster. Smaller businesses have also stored their backup tapes in a safety-deposit box at a local bank, or owners store the backup tapes in a fireproof vault at their own home. Larger companies may choose to contract with a vendor that specializes in offsite storage. Companies dealing with confidential information may prefer to use offsite backup services to ensure the information is secure. An efficient data recovery plan involving off-site magnetic tape storage would not be complete without rotation. Companies must rotate their tape cartridges to ensure that their backup data remains up-to-date. There are several different methods, strategies and rotations that are commonly used to ensure that all data is properly backed up and secure. Here are some insights on tape rotation strategies and how often you should rotate them. A good rotation strategy ensures that the company can access data without fail. It protects the tape from excessive wear and damage, which could make it impossible to retrieve data. Tape rotation requires a regular schedule, often with added expenses that offer greater security against disaster. The frequency of rotation depends on whether the company relies on data storage and retrieval. Companies with high volumes of sensitive data may require a complex and secure rotation schedule while small businesses may only need to implement something simple and cost-effective. Most companies use one of three rotation schedules, including the six-tape, Grandfather-Father-Son, and Tower of Hanoi scheme. The Grandfather-Father-Son (GFS) is the most widely used scheme for tape backup rotation. It combines security with ease of implementation. Its simplicity comes from running on a traditional calendar. On the last day of every month a full backup is performed and labeled ‘grandfather’. This tape is stored permanently offsite. On the last day of every week a full backup is done called the ‘father’ and stored offsite. Then daily an incremental backup is done called the ‘son’. Son tapes can be stored onsite or offsite depending on the volume of data changes. Adding up the tapes you will have: 4 son tapes (assuming a five day work week), 3 father tapes and a new grandfather tape every month.operates on the same principle; however, it involves using more tapes to backup information daily, weekly, and monthly. Companies use the son tapes for daily backup, father tapes for weekly storage, and grandfather tapes for monthly archival. Many companies opt for permanent storage on a quarterly or yearly basis with the grandfather tapes. The six-tape rotation method involves six different tapes used for each day of the week. Many small businesses that do not need to backup high volumes of data use this type of tape rotation schedule. It usually consists of using four tapes for incremental and differential backups between Monday and Thursday. 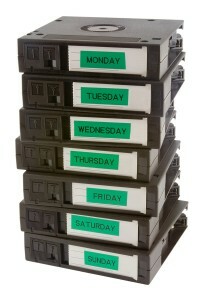 Five tapes are labeled for each day of the week, assuming a five day work week. 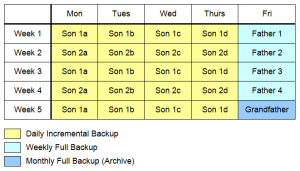 A full backup is taken each Friday and an incremental on Monday through Thursday. The Friday tapes are rotated and stored offsite. The Tower of Hanoi rotation method involves full backup rotation using five separate tape sets. Many companies avoid this method due to its complexity. This method offers greater security and flexibility for full backup sessions on a nightly, weekly, and monthly basis. Tape A is used every odd numbered day. Tape B is used every other even numbered day. Tape C is used every third numbered day. Tape D and E are used every fourth even numbered day. The B, C, D and E tapes are stored offsite. Confused? That’s because this rotation method doesn’t operate on a traditional work week calendar. If you implement this scheme it is wise to have automated reminders to help everyone keep track of what tape is to be used each day. The most important thing for any tape rotation system is to get started. A poorly designed one is far better than being left with no backup at all. Keep at least one tape stored in a secure offsite location. Make sure the backup tapes are accessible at all times. It is also wise to test your backups at least quarterly. What is critical data and where it is located can change and leave you missing valuable information when you need it most. Do a full reload on a test system to see if you can withstand a disaster to your systems. Finding the right offsite tape storage company does not need to be a complicated process. Record Nations provides tape offsite storage and makes finding the right tape rotation service easy. There are several offsite tape vaulting services out there to choose from. Let our experts help you find the service that makes the most sense for your business. To get started, fill out the form to the right, or give us a call at (866) 385-3706. Within a few minutes, you will be contacted by up to four tape rotation and storage experts who can assist you. 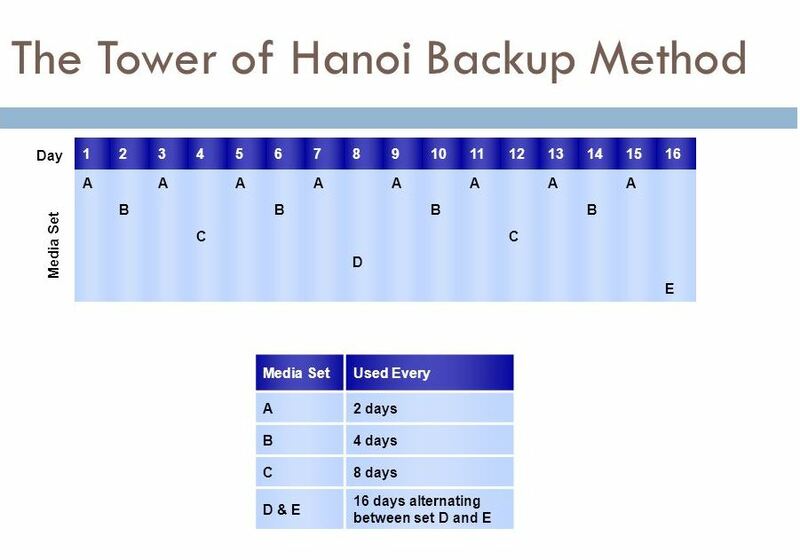 Backup Methods for Data Storage: A webpage introducing the Round Robin, Grandfather-Father-Son, and Tower of Hanoi methods for backing up data. Grandfather-Father-Son Tape Rotation: An educational webpage focused on the most common tape rotation schedule used by companies today. Offsite Tape Vaulting is an Essential Part of Any Disaster Recovery Strategy: Computer Weekly briefly addresses the important aspects of off-site vaulting in data recovery. Backup Methods and Rotation Schemes: PC Mag provides an article that briefly addresses data backup methods and rotation schemes.